Hi everyone. Many years ago, when we first started shipping frameworks, we used to run the code through Envy Code Critic. I am in the process of developing a Key/Value database and would like to do the same when it is ready to go. However, the main elements of the feature are now built in to the browsers but I would like to analyse a single app in one go if possible and get a summary of all the issues. Is there a way to do that in 9.1? Maybe what you are looking for is Tools -> Smalllint ? You need to install the feature ST: ENVY/QA first..
See attached example. You can select as many apps/classes as you want and also select which rules to run. have loaded "ST: ENVY/QA" since years and uses this tool but never seen "Tools -> Smalllint". Sorry... you were right. Thing is...I always load a bunch of features to a clean image so I didn't remember where exactly it came from. In this case, this was "z.ST: Refactoring Browser". "Setting for rendering fonts nicer"
StsCodeFontManager default codeBrowserFontFor: Transcript "
fontName := '-microsoft-droid sans mono-medium-r-normal--13-100-96-96-m-0-iso8859-1'. fontStruct := Transcript shell display loadQueryFont: fontName. "fontName := '-microsoft-droid sans-medium-r-normal-sans serif-13-100-96-96-p-0-iso8859-1'." ifFalse: [EtWindow updateFontList: (CwFontList fontStruct: fontStruct)]. "Setting for sorting apps needing versioning first on app manager"
"Setting to autofocus 'All' tab in class browser"
"Set color syntax max size to something much bigger than default"
"Set custom color for lists"
enhancedListColor := Color fromString: '7D8C93'. 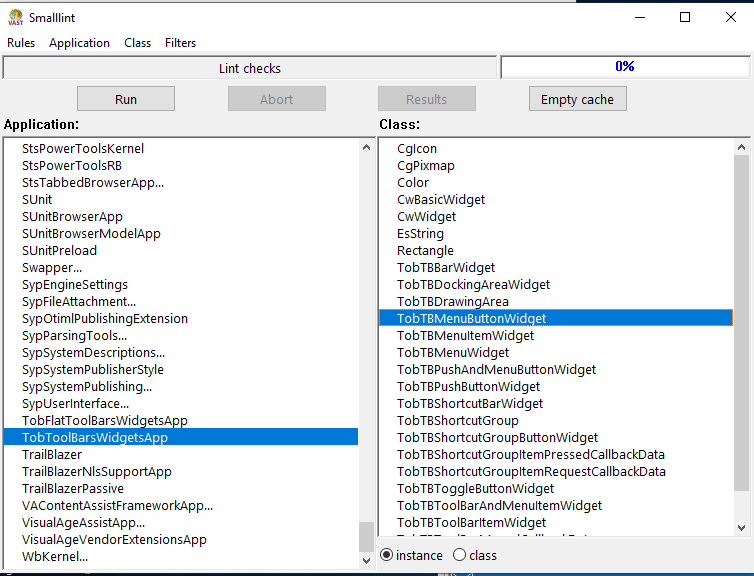 "Select all categories in class browser"
StsPowerTools currentEditorTheme: 'Pharo 7.x Dark Theme'. "Show timestamp as part of editions"
"Show horizontal scroll bars in upper panels of class browser"
"Bigger default size for some browsers"
StsApplicationManager defaultWindowSize: 1024 @ 800. StsTabbedClassesBrowserWin defaultWindowSize: 1024 @ 800. StsConfigurationMapsBrowser defaultWindowSize: 1024 @ 800. MedScriptManager defaultWindowSize: 1024 @ 800. StsTabbedChangesBrowserWin defaultWindowSize: 1024 @ 800. StsTabbedClassEditionBrowserWin defaultWindowSize: 1024 @ 800. StsApplicationEditionsBrowser defaultWindowSize: 1024 @ 800. StsApplicationsChangesBrowser defaultWindowSize: 1024 @ 800. "SUnitBrowser defaultWindowSize: 1024 @ 800." StsTranscript defaultWindowSize: 800 @ 320. "Show line number in debugger and class browser too"
"Show some more icons on the methods selectors on class browser"
StsPowerTools settings removeKey: #IconAbstract ifAbsent: . StsPowerTools settings removeKey: #IconRunnable ifAbsent: . StsPowerTools settings removeKey: #IconSubclassOverride ifAbsent: . StsPowerTools settings removeKey: #IconSubclassesRedefine ifAbsent: . StsPowerTools settings removeKey: #IconWarning ifAbsent: . StsPowerTools settings at: #ShowScratchApplicationHierarchies put: true. StsPowerTools settings at: #ColorChangedCategories put: Color blue. StsPowerTools settings at: #DragDrop put: true. StsPowerTools settings at: #DragDropButton put: CwConstants::Button3. and not the builder renamed tags"
I have tried running your script. I get two errors. On says that MedScriptManager is undefined and the second just tells me that a font failed to load (don't know which one). I deleted the Medscript line and just continued on the font failure. I can now see Smalllint but there are no check boxes in the columns as per the screen shot attached. Also, I can only see two of my apps (TobFlatToolBarsWidgetApp and TobToolBarsWidgetApp. None of my other apps are showing. Sorry but there are no check boxes on load or when clicking on anything. In addition, as mentioned, only a couple of my applications show in the list so even if I could see check boxes I wouldn't be able to analyse anything.